Ed Sheeran has become a bonafide hitmaker in the last several years, making his music nearly impossible to avoid. Kai is an 8-year-old boy who has appeared several times on Ellen Degeneres, serenading last time he was on the show with Bruno Mars. As the song progresses, Sheeran surprised the boy and Kai’s little reaction is adorable. 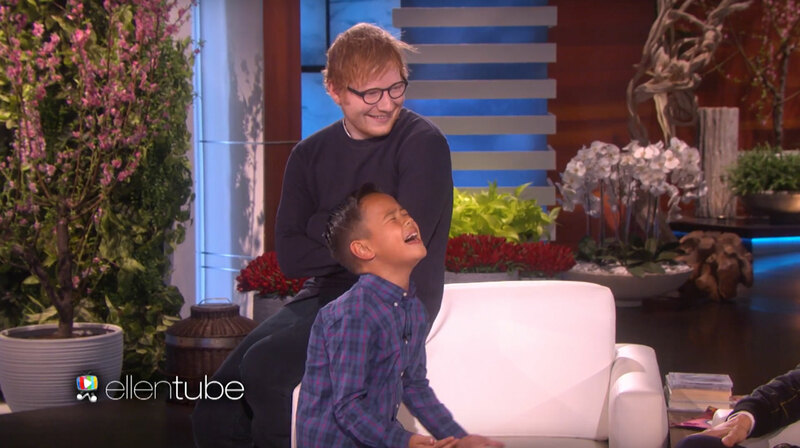 Ellen told Kai that Sheeran was in the studio but we don’t think it registered with him until the famous singer showed up to cheer on his young fan. The crowd even cheers as Sheeran walks out, a cheer Kai probably assumed was for him. Sheeran has a habit of showing up to perform for random fans which makes him an even bigger star in our eyes. Here’s a video of Ed Sheeran performing at a wedding for a deserving couple. Here’s to hoping more people start acting like Ed Sheeran — the world would be a better place.